HI ALL! HERE WE HAVE ANOTHER GRAIL ALERT!! Up for grabs is a mega book!! 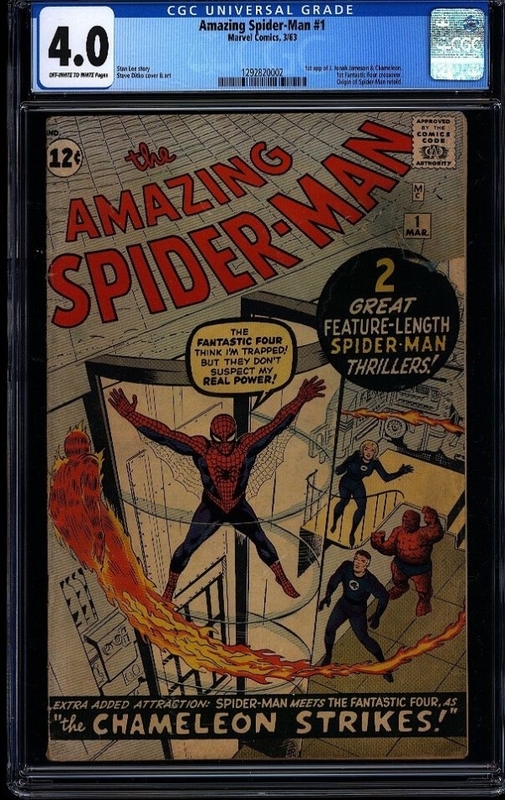 AMAZING SPIDER-MAN #1, first appearance of Peter Parker in his own title!! Feel free to call or send me a note with any questions, always happy to discuss books with other collectors and afficienados!!! This book is CGC graded as 4.0 (VERY GOOD) with a Blue (Universal) label, meaning the book is 100% authentic and unrestored! Book also has a near perfect off-white to white page quality designation! PLEASE LOOK AT HIGH RES SCANS TO SEE THIS BOOK FOR YOURSELF! SOLID LOOKING COPY FOR THE ASSIGNED GRADE! Shipping, Bulletproof Packaging and Full Insurance will ALL be included, and I'll send via USPS Priority Express with full insurance at my expense (domestically). International buyers - Shipping will be at actual cost and typically no more than $75 anywhere in the world!! Time payments are available if needed (must be discussed). And several references can be provided upon request! !